Super Falcons Now To Face Eq. Guinea In Women’s AFCON Group B – Royal Times of Nigeria. The Super Falcons of Nigeria will now face Equatorial Guinea, not Kenya, in the 2018 Women’s Africa Cup of Nations Group B.
CAF’s Appeal Committee upheld Equatorial Guinea FA’s appeal after their spot in the 2018 Women’s Africa Cup of Nations was revoked following a protest that their player, Annette Jacky Messomo, who featured in their Women’s AFCON qualifier against Kenya was ineligible to play for them. 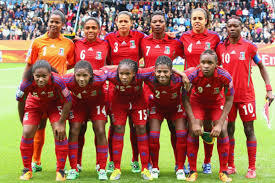 CAF’s Disciplinary Committee had barred Equatorial Guinea from featuring in the 2018 Women’s AFCON and admitted Kenya. And according to a statement issued by CAF’s appeals board, the appeal lodged by the Equatorial Guinea Football Federation was found admissible and that Messomo was eligible to play the game. With this, Nigeria’s Super Falcons will now face Equatorial Guinea on the 24th of November in their final Group B game at the Cape Coast Stadium.